Currently dubbed as the master of the dark and the mysterious by contemporary art critics, Andres Barrioquinto traverses deep into the soul of asian art and focuses on the detailed, colorful approach of early Japanese prints for his new set of works. 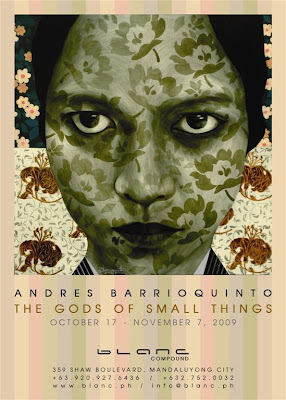 And as Japanese art has often been characterized with its unique harmonizing of polarities, Barrioquinto creates a dichotomy of his own through such portraitures of gloom and paranoia narrated in a calm, relaxing manner. “Disorders make a person beautiful. Because when you are not perfect, that’s when you strive to be. So basically, defect and beauty comes close hand in hand. And sometimes a dent could even emphasize the beauty of something.” Barrioquinto explains. In this show, the artist has also applied a detailed layering of patterns, so as to further emphasize the repetitive, machinated feel of contemporary prints. According to the artist, this show is definitely different from his past anthology of works, because he believes that his new paintings are all equally strong in terms of visual impact. A recurring parade of flowers, cranes, and crows are distinctly playing around his latest batch of portraits. However, if studied very closely, it is also highly noticeable that the overflowing washes of patterns are but masks to the dark, grim personas trapped inside his emotionally saturated paintings. “These are imperfect entities lost in a beautiful world.” Barrioquinto explains. Recently hailed by The Business Times Weekend as a ”Master in the Making”, Andres Barrioquinto’s work matures into a finer, more detailed form, which has evolved both in technical quality and concept. However, despite all these rapid, constant changes, he still retains his signature insignia of morbidity and despair, carefully cloaked in the atmosphere of dark melancholy in his recent works. Through a façade of vibrant hues and embellishments, Barrioquinto continues to emanate an undetected presence of a black hole that exists inside every one of us. Through the aide of such visual paradoxes he continues to show it and take his audience away into a world of his own untamed imaginings, where destruction is redefined as the springboard of beauty, and eventually the endpoint of it. Overall, The Gods of Small Things is an inevitable journey to madness, forcing a certain twinge of confusion to the senses through the contrasted marriage of darkness and beauty, of serenity and discord. “Some paintings are not meant to be beautiful,” Barrioquinto says in a mysterious tone while manually depicting a sea of designs shrouding the entirety of his large scaled canvasses. With this perfect quote he ends the interview. The Gods of Small Things runs until November 7, 2009.